I use the winter months as a time to sort, inspect and maintain the rods, reels and other gear I use and abuse spring, summer and fall. This way, I have everything ready when the water softens in the spring. Reels get new line and a lube job. Rods are inspected and each rod guide gets the Q-Tip test. By spinning a Q-Tip in each guide, I can find those with hard-to-see chips or cracks in the ceramic inner surface. The cotton on the end of the tip will catch and fray: Time to replace that guide so it’s not catching and fraying your line in summer. Some rod guides don’t need the Q-Tip test to see they are broken – they are just plain broken and need to be replaced to put the rod back in action. 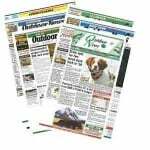 Replacement guides are widely available or you can do what I do: When I really break a rod, by snapping it in half or crushing it, I salvage the guides off of them before discarding the rod. Over the years, I’ve collected a variety of sizes and colors for reuse. With the right tools and supplies, removing a broken guide and replacing it is not a particularly difficult task. It’s the “right tools and supplies” part that stymies neophyte rod repairmen. If you want the finished repair to look exactly as it did when new, take it to a professional rod repairman. They can perfectly match the rod guide, use the exact thread size and color the manufacturer used, and finish the job with identical varnish or thread coating. However, if all you want to do is get the rod back in the game and don’t mind the repair looking like a patch-job, you probably have the needed material on hand. There are a variety of rod-building tools available to make the job easier, but fundamentally, the only tool you’ll need is a box-cutter-like razor knife to remove the broken guide and cut the wrapping thread. The materials list includes some braided fishing line, a roll of tape, some super glue and an appropriately sized rod guide. Once the broken guide is removed, tape the replacement guide in place around one of the feet of the guide. 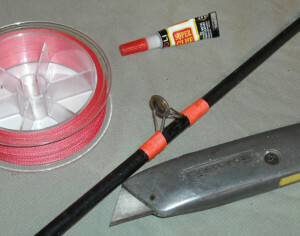 Then use the braided line as thread to lash the remaining foot securely to the rod. (There are dozens of videos on YouTube showing how to start and finish the wrap to secure the beginning and end of the wrapping thread.) Once one foot of the guide is secured with the braid, remove the tape from the other foot and wrap it just as you did the other one. Rod repairmen have special equipment to cradle the rod while it’s being wrapped and to keep tension on the wrapping thread. If I repaired rods every day, I’d get the special tools as well. Without the tools, I just hold and rotate the rod with my fingers. I adjust the thread tension by running the braided line under my foot and stepping down harder or more lightly to get the resistance that feels right. Instead of using rod varnish to coat and keep the wraps in place, just drip several drops of super glue on the threads. Spin the rod for several seconds while the glue sets up and dries and the repair is done. It may not look like new, but it will work like new. The fish don’t care.